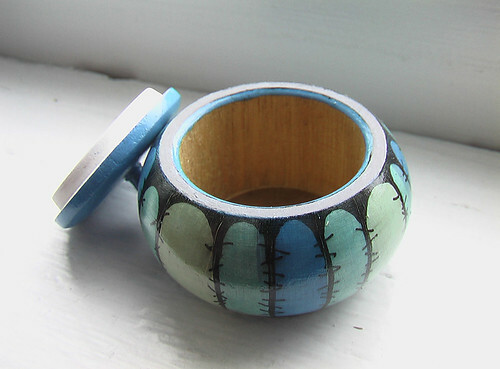 This rounded unique maple wood turned box has been gessoed, sanded, meticulously decorated artist quality acrylic then varnished four times for durability. The inside is sanded smooth after a couple of coats of gesso. “Burst” is signed on it’s bottom by me, the artist and is availble for purchase in the art shop within the Handpainted Boxes Section. 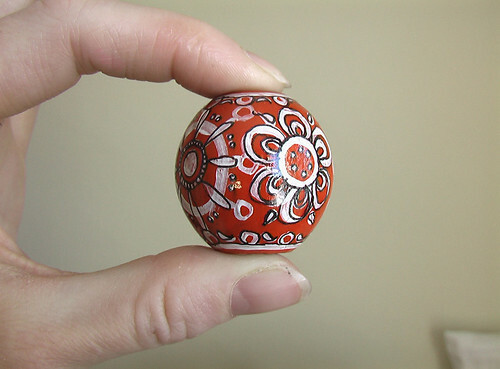 Box Dimensions – 1 1/2″H by 2 1/8″W (H-3.8cm by W-5.4cm) It’s tiny! The original is for sale in my shop and 5″ by 7″ prints are now up to. 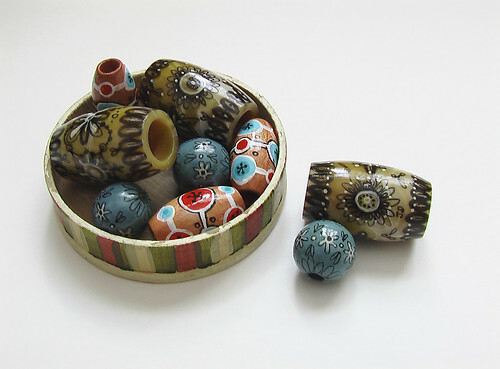 A selection of the most recent *OOAK Art Beads that I have painted with India ink and acrylic. They are each varnished three times for durability. 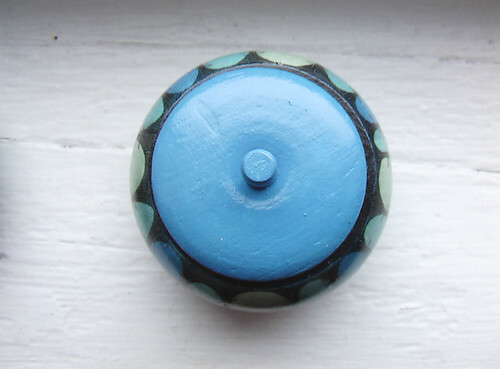 The small blue one in the foreground measures 5/8″ or 15mm. This post from earlier this month featured a close up of one of these beads. 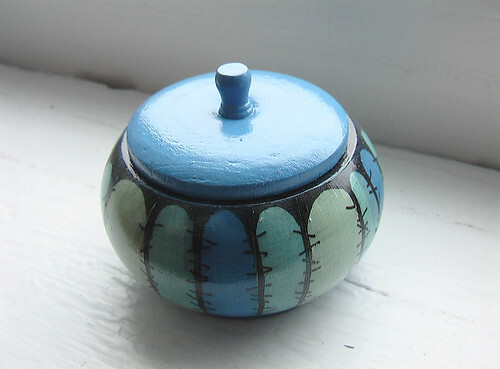 I have been decorating, giving as gifts and selling little miniature boxes for over 15 years. When I think about that, it makes me smile. It feels good to know that I can stick with something! 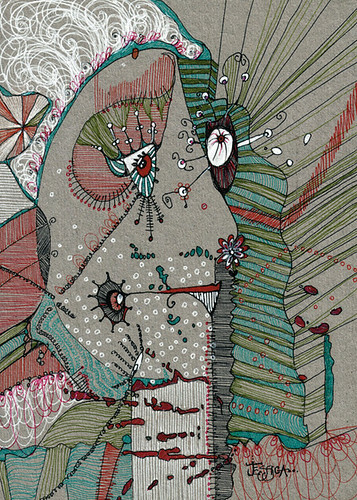 There is only one thing that has stayed with me through sickness and health and that is the gift of art; the urge to continue creating unique little insane one of a kind treasures. Or in this case, a little box to hold your secrets. 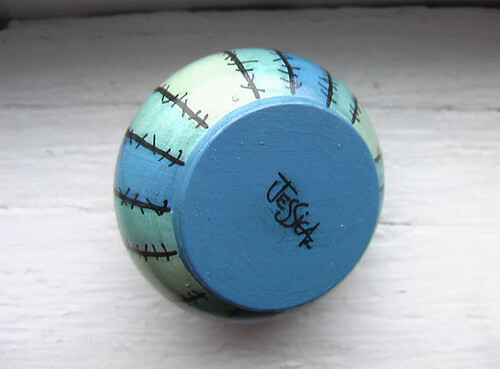 This rounded unique maple wood turned box has been gessoed, sanded, meticulously decorated with India ink and artist quality acrylic, rubbed with a honey colored stain inside and out then varnished three times for durability. Moody Blue is signed on it’s bottom. What did I put into a box?